There seems to be a theme. 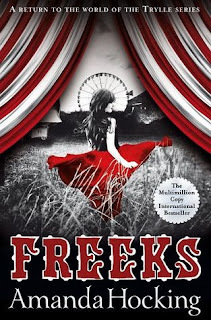 If the book involves a carnival or a circus, the cover artist must always use the same colour palette- black, white and red. Always bringing it back to The Night Circus (by Erin Morgenstern), so an expectation is already being built and one thar never seems to be met. Use other colours. There's a whole other spectrum!! I guess you can tell that this cover didn't wow me. And still doesn't. It's very 2012 YA- girl in a dress. And now can't help but think of a young Theresa May running through a field of wheat- so there's that. Although I do quite like the typography used for the title. This is my third attempt at reading a book by Amanda Hocking and probably the last one, I think. They're quick reads, but they just leave me bored and unsatisfied. I have this thing where I will call something "old YA"; I can't make a definitive definition of what I mean by this other than: a book that no longer pushes the boundaries of writing, relies on tropes and basic character archetypes in order to repeat a story. I found the writing simplistic (which isn't a bad thing mind, it was accessible). The thing is, the character where tropey, nor were they built upon leaving them as 2-D and flat. That sounds more harsh than what I mean it to be, but I was just left with a bad taste of insta-romance and shadows, rather than character's who were fully fleshed out. Townies and Carnies? This just pissed me off. It's like Travelers and Gorgers. Prejudice and ridiculous. It just wasn't needed. Another part of the book that just didn't gel with me. I did really like the time era this was set in- the 80's! The small tidbits of pop culture references, the lack of a mobile phone, retro cars. Although I did question whether you could say the book was set in the 90's or early 00's and it still be applicable? Either way, it was the one thing that I did like about the book. Hi, I'm visiting on my blog hop from Twitter, if you can remember me :) I think I know what you mean by "old YA"! Not very nice to read anyway. I know carnival/circus books that don't have that kind of cover though :) one is Geek Love (not that kind of geek, apparently there was a different meaning before it meant what it means now). That book was great, although it's not YA at all.